i've been pretty quiet lately. i made something i had the idea for 4, maybe 5 years ago tonight. it's not as awesome as i had really hoped it would be. it's meant to be used to put buttons of your favorite things on. like, favorite animals, favorite bands, favorite crafters, whatevs. 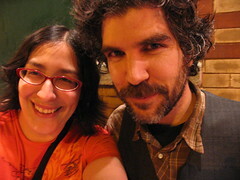 i saw hayden, one of my longtime faves at schuba's on saturday night. i made him blueberry muffins since i had leftover batter and after the band left the stage, i put them on the stage. he came back for the encore and went on about how terribly they had been eating and how nice it was. then outside i saw him eating one as i stood there waiting to say hi and someone asked him how it was and he said "good". when we started talking i said i had made the muffins and he said "oh thank you! i'm glad i said it was good!" sometime recently it had hit me that i had been a fan for over 10 years and that it had been just over 10 years ago that i saw him for the first time (and interviewed him). 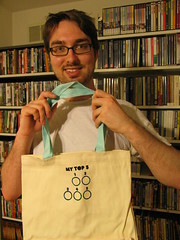 i mentioned this to him because wow, it's been 10 years, and he said something like "well, come on! i've seen you a bunch since then." come on hayden! nostalgia! we're getting old. he has white in his beard and i would be lying if i said it didn't look hot. this weekend i bought a new bike from this bike guy kevin. it's a kulana moon dog. 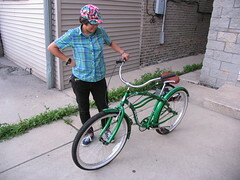 i think it's a men's frame, but i don't really care since i think i can transform it into a very leigh bike. rachel is totally the bike-iest person that i know and she has been very helpful. next to get a basket and possibly a new bike seat since this one is a bit too firm for me. 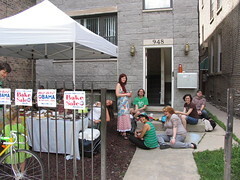 a couple weeks back i threw one of 700+ bake sales across the country organized by moveon.org to benefit their campaign to put barack obama in the white house called HUNGRY FOR CHANGE. mine was called "UKV IS HUNGRY FOR CHANGE BAKE SALE" and ran from 10-4 on a saturday right in front of my house and we raised nearly $1100. i made a ton of stuff, as did lots of friends and also people i didn't know. it was a great experience. if they do another one, i will do it again. having miss alison's tent was so very awesome since it did ran for a spell. also to note in that picture: i have awesome friends. yes, things are good. hoggle is in my lap and it is time for me to sleep since he is very alert and ready to run in the wheel. also, i have been watching lost and i am loving it. wish i could watch it all day long to catch up. this post is seriously full of awesome. everything you said here makes me smile! where did you get that bike? was it cheap? jeff needs a bike. it was $125, but he sells a ton of bikes on craigslist. his name is kevin. i will email you his number. word! i love you. and i can hardly wait to meet you. and you need to call me because my phone broke again and i have no numbers! !